Just as we take time out of our busy lives to care for our teeth, we need to do the same for our dog’s dental health! Dogs, while not as prone to cavities as us, can develop dental issues, too! Plaque and tartar can cause not only just bad breath or yellow teeth, but also serious issues with their heart, liver, and kidney. 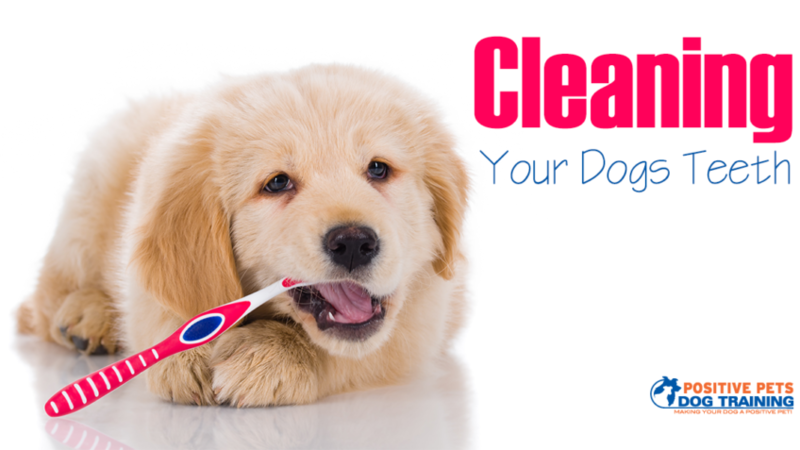 It is very important that you add dental cleaning to your pup’s hygiene routine. Here are some tips to help you keep your dog’s pearly whites and the rest of their mouth in the best condition! The biggest issue many owners have is actually brushing their dog’s teeth. In general, your dog probably doesn’t love you having your hand in their mouth poking and prodding around. The first step is to get an angled toothbrush with a 45 degree angle. This helps you get into places that a normal toothbrush and yourself couldn’t get to, like below the gum line. The best time to brush is when your dog has exercised and is tired out, so they won’t be as antsy throughout the process. Start out slowly and build up to doing the whole mouth. Odds are your dog will only be able to handle it for a little so just go back and finish the other spots later. If you reward your dog with treats and keep the experience exciting and fun, they should start to enjoy it. It is also important to start young if possible, since making this a part of their routine early on makes it easier to do later in life. Human toothpaste is almost always dangerous to dogs. Fluoride, a ingredient in most human toothpastes is very poisonous for dogs, so always get a dog specific toothpaste. There are many toys/bones on the market that clean your dog’s teeth while entertaining them. They strengthen their teeth as they chew, making it an easy way to add dental health into your dog’s life. While this is great way to remove build up, it is not a substitute for brushing. Make sure you continue to brush and contribute to their dental hygiene. When you go to the vet for a normal checkup, they will check your dog’s teeth anyway. But be sure to point out any issues you’ve noticed as well. Make sure you are always being preventative with dental care. It is much more expensive to get your dog’s major issues fixed than it is to take some time to brush regularly. Good luck and happy brushing!